Jaipur : The morning kicked off at the Mahindra Humanities Center Durbar Hall when American photographer, Steve McCurry recalled walking into a tent to avoid the harsh 11am sun in war-torn Peshawar, Pakistan and seeing her: Sharbat Gula, the green-eyed 13 year old girl who ended up being the subject to his most iconic portrait, the Afghan Girl. ‘You could see the trauma,’ McCurry said, ‘but she had this human spirit to move on’. Steve McCurry talked at length about his inspirations, travels and life in general with historian, writer and ZEE Jaipur Literature Festival co-director, William Dalrymple. The conversation inevitably shifted to McCurry’s new book INDIA. The book includes photos of his personal journey and people he emotionally connected with. ‘I wanted my first book on India to include my favourite photographs,’ he said, adding that the depth of the culture in India never fails to intrigue him. He had a ‘love affair’ with India the first time he set foot here and here’s hoping India never fails to welcome this lover of hers. Amity University, the Festival’s University Partner, conferred a Doctorate and Professorship on Steve McCurry at a ceremony at the University this afternoon ensuring that he will always be welcome here in Rajasthan. Writing has emerged as a parallel career for many young professionals and businessmen, among the torch-bearers of this change has been the author of best-selling thrillers Ashwin Sanghi. 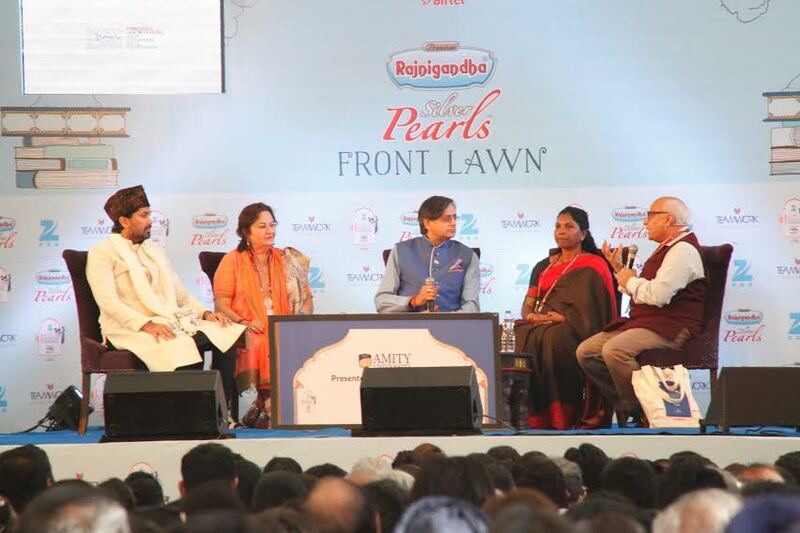 In its ninth edition, the ZEE Jaipur Literature Festival played host to the writer as he discussed his work with his publisher Sudha Sadhanand and acclaimed Bollywood actress Kajol. Famous for her roles in Bollywood movies like Dilwale Dulhaniya Le Jayenge and Kabhi Khushi Kabhie Gham, Kajol was welcomed to the stage with roaring cheers by the fully-packed Rajnigandha Silver Pearls Front Lawn audience. Professing her love for reading, she shared memories of growing up surrounded by stacks of books belonging to her mother. Over at the Char Bagh tent this morning were grittier topics. Income inequality is perhaps one of the grimmest realities that the world has to deal with. With capitalism gripping every nation, does the lion’s share of profits get appropriated by the rich businessmen or does some redistribution of income take place? Today’s session with Thomas Piketty, highlighted the need for “democratization of economic knowledge”. It is equal opportunity for all that can facilitate the making of an equal society. The Government of India’s Chief Economic Advisor, Arvind Subramanaim observed that in the last few years, poorer countries like India have caught up with rich ones like the US in terms of growth rates of their national incomes. ‘Since I was 4, I’ve been a writer’ said Stephen Fry, though he wryly remarked a little later that ‘we’re all content providers in the 21st century’. This predictably led to Anandita Ghose asking Fry about his writing method to which he replied that everyone at literature festivals was always ‘very anxious to know the process of other writers’ because they felt that maybe if they used the right kind of pen, paper or word processor, they would be more accomplished. The only technique he recommended to the eager young writers in the audience was a trick he learned from the English author, Graham Greene. Greene would always end a session with an unfinished sentence so that the next day could begin with ease. Stephen Fry is renowned for his mastery of the English language and his full range was on display at the session. He called speech one of the ‘highest forms of expression’ with the power to ‘beguile, charm, seduce and delight’. In the Char Bagh over lunchtime audiences had a treat as Margaret Atwood, Colm Toibin, Aleksander Hemon, David Grossman, Sulaiman Addonia and Sunjeev Sahota discussed The Global Novel. Margaret Atwood said, ‘One thing that the novel can do is take you into the reality of the time it has been recording for much longer in the future than television can do’, she iterated. Novels have the ability to contextualize and take you deeper into the consciousness of the characters. Commenting on the idea of reading a novel hundred years after it was written, Toibin called the novel ‘a shimmering, glittering form that changes as time changes’. This afternoon’s session The Need to Listen: Dialogue versus Rhetoric, explored the increasing trend for dialogue between different groups to either descend into rhetoric or escalate into violence. The speakers represented vastly different viewpoints, and this made for a thrilling talk. It was a heated debate, ending on a note of hope when Syed Salman reminded the audience, ‘this is not BJP India and not Congress India, this is our India.’ He quoted the words of the mystic poet Rumi: 'Come, come whoever you are, we are a gateway of hope and not despair.' India is the gateway of hope, he declared, to thunderous applause. The afternoon saw the crowd in fits of laughter on the Rajniganha Silver Pearls Front Lawn as Sidin Vadukut, Suhel Seth and Meera Syal explored what makes South Asians laugh, proving that they had many ways to tickle funny bones. History fans were wowed by a panel of authors and experts including Irving Finkel, Cyprian Broodbank, Caroline Vout, Naman P. Ahuja and Vidya Dehejia in Why Ancients Matter. Tara Gandhi Bhattacharjee proved the most captivating storyteller in a session at the Char Bagh with Tridip Suhrud, Pramod Kapoor and Salil Tripathi with personal memories and great wisdom. Two prize giving sessions celebrated the visual arts and poetry today at ZEE Jaipur Literature Festival. The Ojas Art Award, in this its second year recognised the best in Madhubani and Mithila traditions of visual art was presented by Steve McCurry. Santosh Kumar Das was awarded the Master Artist title and the Protege Artist was given to Mahalaxmi and Shantanu Das. The awards include a cash prize of of Rs. 51,000 and Rs. 31,000 respectively. And the first ever Kanhiya Lal Sethia Award for Poetry was awarded to Rituraj, Rajasthan’s celebrated poet, following the decision of a distinguished jury comprising Arvind Krishna Mehrotra, Ashok Vajpeyi and Siddharth Sethia of the KL Sethia Foundation. The award was presented by Tara Gandhi Bhattacharjee. This auspicious poetry event was followed by the daily poetry hour, this evening with contributions from Hari Ram Meena, Nguyen Phan Que Mai, Sitanshu Yashaschandra, Uday Prakash and winner of KL Sethia Award Rituraj. As dusk fell audiences were preparing to head to The Amber Fort where the magic of Sufi will embrace the audience with singer Mukhtiyar Ali. A rare marriage of the masculine and the feminine voice, Mukhtiyar Ali merges the earthliness of folk music and the complex octaves of the classical traditions. Jaipur BookMark concluded yesterday evening with the presentation of the Oxford Bookstore Book Cover Prize to its first winner, designer Bena Sareen for the book, Talking of Justice by author Leila Seth, published by Aleph.